The 2019 Texas Legislative session began on Tuesday. I am proud to be serving my 15th session in the Texas House. Thank you, District 147, for re-electing me to serve our community in the Texas Legislature. 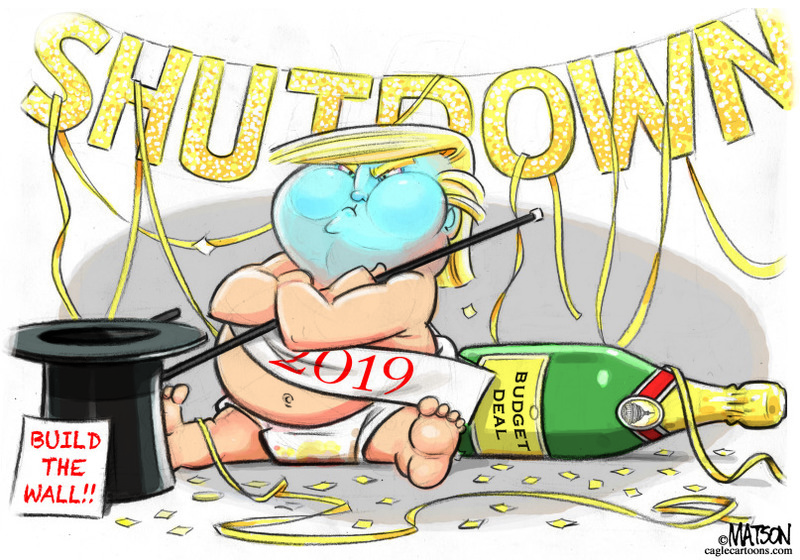 Our friends at the Center for Public Policy Priorities have compiled a few things to look out for in the first weeks of session. You can read what to expect below or click here. Leadership Priorities: The first 20 House bills (House Bill 1 through House Bill 20) and the first 30 Senate bills (Senate Bill 1 through Senate Bill 30) are reserved for the priorities of the House Speaker and the Lieutenant Governor. The Rules Matter: The House and Senate set their own rules for session this week. The rules set the tone for the session and establish the playing field. If lawmakers set fair rules and follow them, it creates an atmosphere where lawmakers truly debate policies and work through disagreements. On an issue like school finance where regional differences matter in terms of funding, the rules of engagement can make a huge difference for fair funding for all students. Congratulations to newly elected Speaker of the Texas House, Representative Dennis Bonnen (R-Angleton). I am confident he will be a strong Speaker and I look forward to working with him and our other colleagues in the Texas House. This session, I will be focusing on public education funding, expanding health care access, and criminal justice reform. I have already filed a health care bill, which you can read about here. I will continue to stand up for HISD and push for quality full-day prekindergarten. Click the links below to see my past accomplishments in health care, public education, and more. 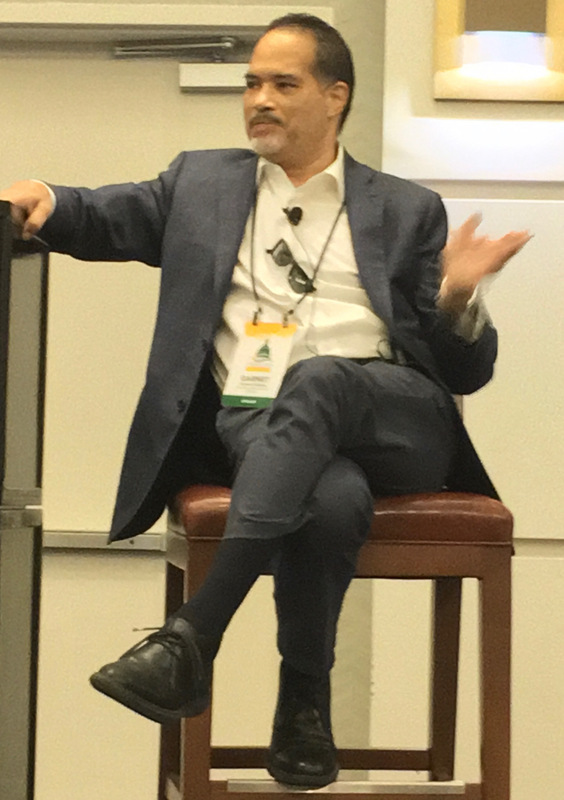 Please click on the links below to see my wrap-ups from the last few sessions to see what we have accomplished. Stay tuned for updates throughout the session. We will send out weekly newsletters, policy updates, and news alerts. You can also follow us on Twitter, @GFColeman, and Facebook at fb.me/RepGarnetColeman. Our Capitol office number is 4N.10, located in the Texas State Capitol building. Our Capitol office can be reached at 512-463-0524. 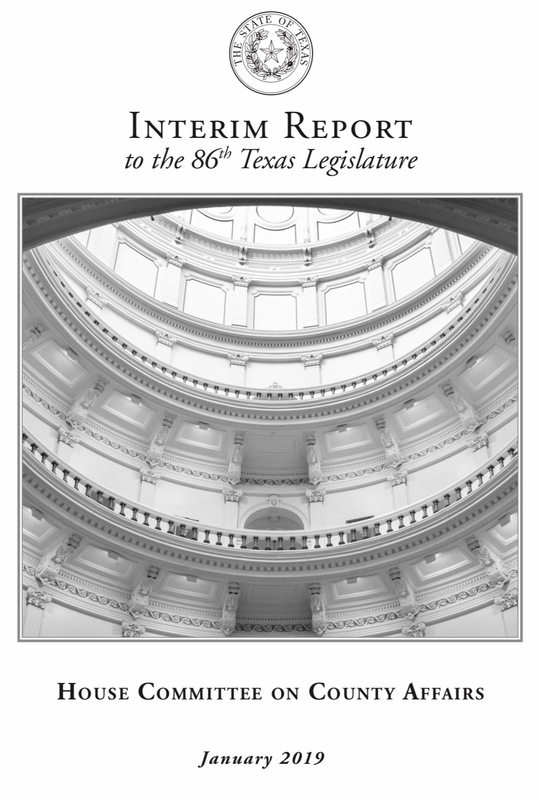 This week, the House Committee on County Affairs interim report was published online. Click here to read it. I thank all my committee members for signing on to the report: Vice-Chair Drew Springer (R-Gainesville), Rep. Todd Hunter (R-Corpus Christi), Rep. Jonathan Stickland (R-Bedford), Representative Victoria Neave (D-Mesquite), Representative Kevin Roberts (R-Houston), Representative Tomas Uresti (D-San Antonio), Representative Shawn Thierry (D-Houston), and Representative Kyle Biedermann (R-Fredericksburg). One of the most important recommendations in this report is that the Texas Legislature should consider issuing general obligation (GO) bonds to help areas affected by Harvey. Issuance of general obligation bonds with debt services from the Economic Stabilization Fund (Rainy Day Fund) can provide adequate funding to aid in local disaster recovery. While local governments have a mechanism to apply for federal disaster recovery funds, the federal funds are not enough and there is no comparable dedicated state fund. Despite various public-financing options available to local governments, many counties and cities lack the ad valorem tax base and other revenue sources to properly fund debt issuance. Thus, it is the report’s recommendation that we issue GO bonds to help our fellow Texans rebuild. The report also has other important recommendations regarding diversion into family drug courts before CPS removal, improving behavioral health in schools, and other key recommendations to improve county government to better serve Texans. As reported yesterday on ABC 13, “The White House is directing the Army Corps of Engineers to find money within its own budget to fund President Trump’s border wall under a national emergency declaration, including money earmarked for Hurricane Harvey relief.” This is dangerous, irresponsible, and wrong. President Trump should read over our County Affairs Interim report which includes recommendations on repairing after Hurricane Harvey. 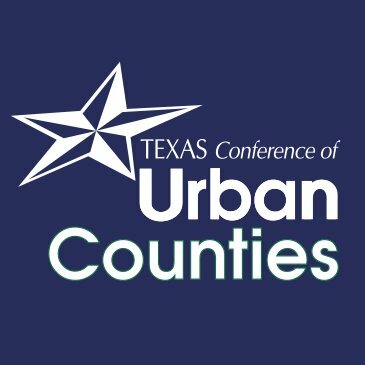 On Thursday, I was honored to deliver the keynote speech Texas Conference of Urban Counties Policy Conference, where I discussed our findings in the County Affairs Interim Report. 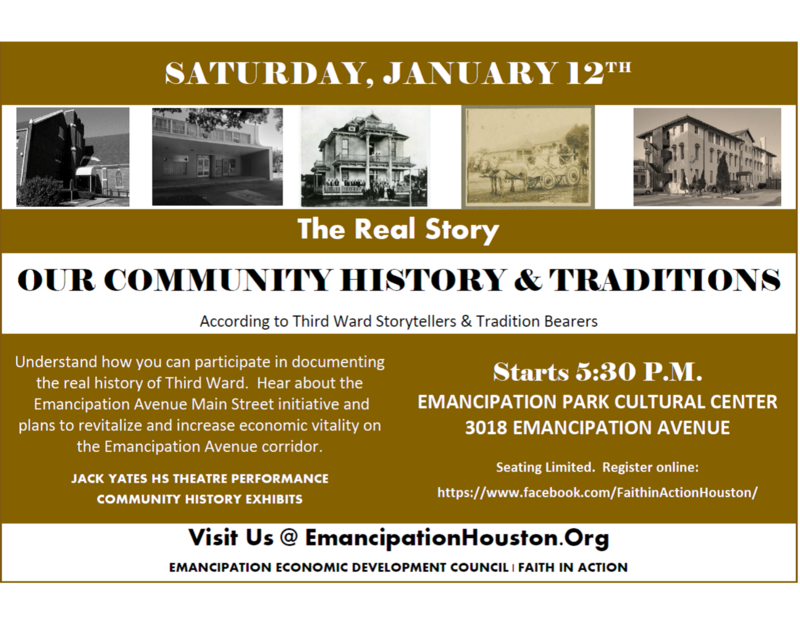 You’re invited to The Legacy of the Emancipation Park Neighborhood. Click here for more details and to RSVP. Learn How to Get Involved in Third Ward Community Initiatives! residents, families, and businesses in our community. vitality of the Emancipation Avenue Corridor. Freedom’s Eve in Our Community. Saturday, January 12, 2019 @ 5:30 p.m. 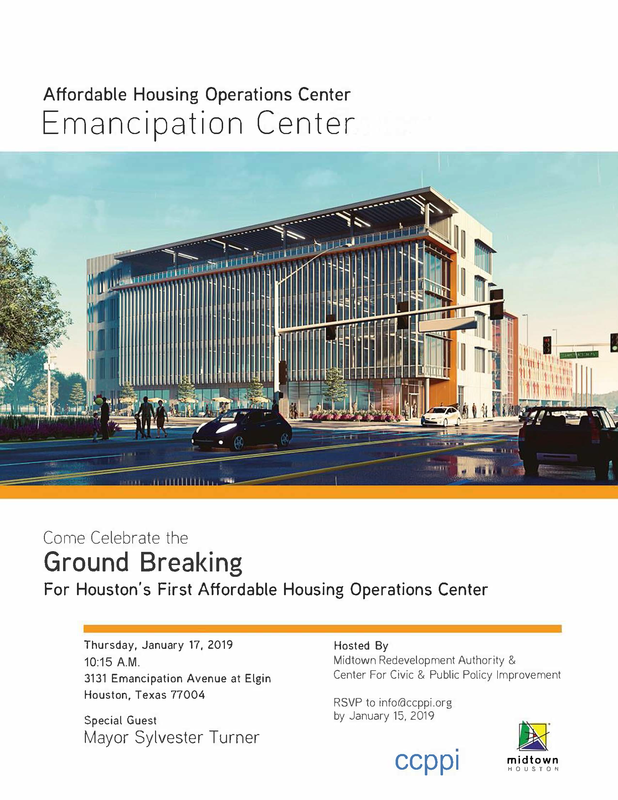 Please join Mayor Sylvester Turner and I next Thursday, January 17th, at 10:15am to celebrate the ground breaking for Houston’s first affordable housing operations center. The ceremony will be held at 3131 Emancipation Avenue at Elgin. RSVP to info@ccppi.org. We look forward to seeing you there. Our video of the week is from PBS NewsHour. You can watch the video below, or click here. Our song of the week is “This Land” by Gary Clark Jr.